I haven't had a whole lot of time to work on the piece that I started the other day. Although I've gotten a bit farther with it, rather than bore you with an incremental change, I thought you might enjoy seeing some instructions for doing embroidery stitches with beads. This is a different style than I usually use, but definitely something to think about. 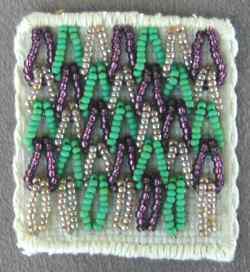 Some of these stitches would look absolutely beautiful in a crazy quilt or on patterned fabric that you weren't planning on covering totally with beads.